When you’re logged in and looking at your dashboard, click on the Job Orders tab in the left navigation panel. By clicking it you will be redirected to jobs listing page. On each job order row, you will see a bionuclar icon on the left hand side next to Actions button. Click on binocular button it will open quick detail of any job you like to see. Or you can Click “X” button on top right corner of the quick detail and close it. You can edit job details in quick view and detailed view of any job. 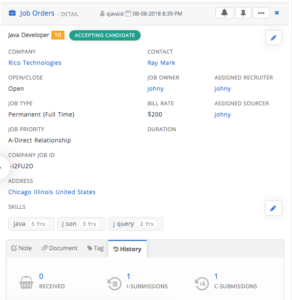 After closing the quick detail you can click on any job in the list that you have added and can view in full description. Once you are done editing click on check button to save changes or cross button to cancel changes then click on Edit icon and exit editing process.